This weekend, my family and I rented a condo in Estes Park that’s right on the Fall River. It was really a family trip, not a fishing trip, but I took my tenkara gear anyway. I’ve been caught off guard too many times without a rod after stumbling on to easy fishing opportunities. So now, I take at least some gear with me wherever I go. This particular stretch of river by the condo isn’t exactly blue-ribbon water. Actually, I’d call it whatever the opposite of that is. It’s pretty much dead water with little structure for fish to hold and no real character to speak of. I’ve fished it several times before with very low expectations and those expectations we’re consistently met–not one fish. Past experience and the fact that the water was high didn’t give me high hopes this time either. Add to that that there’s only about 30 yards of river on the property to fish which is crowded with clueless bobber fishermen spooking fish left and right, and you can imagine I wasn’t very optimistic. But, there was a river in front of me and I had a tenkara rod, so how could I not fish it? On the first day, I snuck out for about half an hour while my daughter was taking a nap. With the high flows, there were literally only about 5 fishable spots (mostly very narrow and short slots along the banks where the water was slower). I worked these as much as I could with no luck. To say that it wasn’t the ideal fishing situation would be an understatement. My typical M.O. is to cover a lot of water and not spend more than 5 minutes or so in a spot before moving on. But with limited viable spots and a very limited stretch to fish, everything was up to the river, not me. As expected, I didn’t catch a thing. But I wasn’t too disappointed because it just felt good to be on the water and at least I got some casting practice in (some of those slots were no more than a foot wide and two feet long so you had to be really accurate with fly placement). I returned to the condo, hung up my gear and willingly accepted my predetermined defeat. The next day, we went for a nice hike up to Bierstadt Lake. Again, I took my tenkara gear but it was very windy and there wasn’t even room against the bank to backcast. Another no-go. But it was nice to just be out with the family and take in the scenery.Bierstadt is beautiful, but not the most tenkara friendly lake. After we got back to the condo, it was nap time again for Emma. For whatever reason, I decided to give the stream another shot, almost as if the memory of the day before had been completely erased–like Sisyphus thinking he’ll actually get the rock up the hill this time. In the back of my mind, I knew I was doomed but I was strangely determined to change my destiny. I told myself that if I could catch a fish (just one fish) under these conditions, it would say more about my skills than any 50+ fish day I’ve had. After all, it’s easy to think you’re a good angler when you’re catching a fish every other cast (though in reality, it probably says more about the gullibility of the fish than the talent of the angler). So, I challenged myself: catch just one fish from the water you’ve deemed impossible and you’ve got some worth as an angler–some stream cred. I really focused this time and repeated a mantra in my mind that “there’s a fish there”. Then, it happened … I caught a fish! It was a pretty small brown (see photo above) but that didn’t matter. Just feeling the tug of life on the end of the line after such a poverty mentality was incredibly motivating. I think it was probably the most meaningful fish I’ve caught all season. With a renewed sense of confidence, I moved to another spot under a bridge and on the first cast, caught another (even smaller) fish. Success! 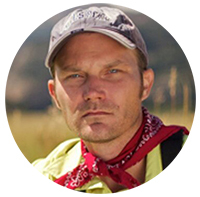 I felt redeemed and was ready to push myself even further and see how many more I could pull from this “impossible” water. Either fortunately or unfortunately, the typical Rocky Mountain afternoon thunderstorm rolled in quickly and thwarted my plans to become increasingly cockier with every fish I caught. So I called it. Secretly, I wondered if it was nature trying to keep me humble. So, two fish. While far from a “stellar day” I still think it was a good day because I learned a valuable lesson: perseverance pays. Even if it’s in small change. First day one fish and 3 hits. Second day total shut out. Third day a repeat of the first. Lots of large fish swim by but not ones that are much interested in flies. It is by no means a trout stream though some local companies do stock them in the spring. I had some 16 – 18 inch Red Horse and Catfish swim by, even bumping me on the legs a few times. So I clearly wasn’t scaring the fish off while wading. 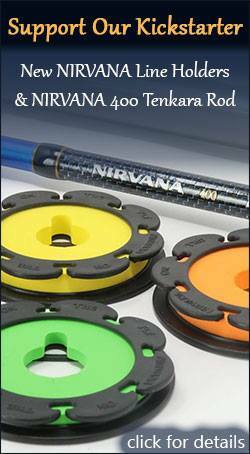 However, Tenkara casting can be a fun activity in itself, and has its own rewards, even if I don’t catch any fish. So I improved my casting technique, and I have an excuse to tie a few new flies to replace ones I lost to tree limbs practicing low cast under overhanging shrubbery. The Joy of Casting. + seeing the ducks doing their sometimes odd behaviors and swimming about with their new off spring, hearing the other species of birds and deer in the woods, and get my daily air sorties from bats as dusk sets in. Once I see a few lighting bugs, soon a few bats appear, followed by dozens of them within the next 15 minutes. Hitting my rod and line, occasionally the bill of my cap. Time to make a quick exit from the river. : – 0 Two more weeks before I can return to the family vacation house which is about 2,200 feet higher in elevation with several colder water streams nearby. Stubbornness pays out more than talent! Jason, next time you are up here in EP, stop by Scots Sporting Goods and I’ll let you in on the HOT spot on the Fall river. I’m at the shop thurs, Fri & sat. Oooooh, sounds great! I usually fish it in the park and haven’t explored it much beyond that. This is also a tale of perseverance, but of a slightly different kind than Jason’s tale. I do some float tube fly fishing on large artificial lakes with some fly fishing friends, mostly because that’s the kind of fishing they enjoy doing the most. Although I admit that I would be much better off, catching fish wise, if I used Western fly fishing tackle like they do for this kind of fishing, I love fishing with fixed line rods so much that I continue to leave my Western fly fishing tackle at home and take my lumps with a fixed line rods as I often cannot get my flies deep enough in the water to be able to catch the deep feeding trout found in the previously mentioned lakes that my friends usually catch quite handily with their sinking fly lines. But on our last outing I out performed my friends with a fixed line rod, although not by much. But a slight victory is still a victory of sorts that I will gladly accept. Ron had a number of hits but did not hook or land a fish on that day. John also got a number of light taps, and he hooked and played, judging from the deep bend that the fish put in his rod, a very nice sized fish that got off before he could land it. I also had a number of light taps early on, and I hooked a total of 3 fish. One of which was a very nice rainbow I could have landed, but it got off while I was holding it on the line in the water for John to see, and he couldn’t paddle over quickly enough to get a good look at it before it got away. The rainbow I released was caught deep in the water, while the other two were caught on a size 12 Two-Toned X-rated Ant pattern, fished on the surface with a 12′ long 000 WT. Tapered floating fly line, and a 9′ or so long tapered, hand-tied leader and 5X FC tippet material. But it was the deeply caught fish that really made my day as that was where John and Ron had always been able to catch fish before when I couldn’t possibly compete with them with the Tenkara style tackle I had used in the past. 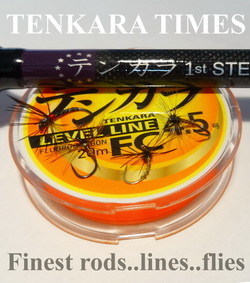 Tenkara style fly fishing is pretty much a business of presenting flies to fish that are relatively close to the surface in the water. 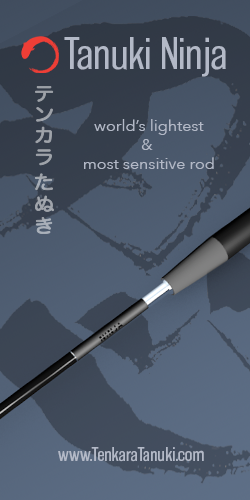 The following is the line tackle that I used to reach these deep in the water feeding lake fish – Rod, Diawa 43MF Keiryu rod, a 380 and 430 cm length zoom rod. Line – 14′ of level size 4.5 FC T-line, used as an extension; plus 10′ of T-14 tungsten impregnated sinking fly line, that weighs 14 grains per/foot; plus a 6’length of a clear Intermediate 5 Wt. sinking fly line; on to which was looped 3′ of 5X FC tippet material, with a size 14 Tungsten bead head Mini-Orange Wooly Bugger used as a dropper fly, then another 3′ of 5X tippet tied to the hook of the dropper fly used as a trailer, and a Chartreuse Mini-WB tied on as the point fly. The fish I landed took the Green fly completely into its mouth after a number of light taps. 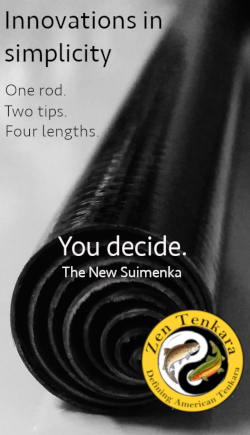 This little story just goes to show that you can figure out ways to catch fish that feed deep in the water with fixed line rods if you are willing to go beyond what is considered to be Traditional Tenkara angling techniques. The presentation is a trolling action, which requires no casting of the rod, line, and/or flies. The 43 MF is a 28 and 33 penny rated rod, with a fast 7:3 rod action, which has plenty of backbone for setting hooks into the mouths of deep in the water feed fish. That big fish was pulling me around the lake in my Fish Cat, which is a lot of great fun. 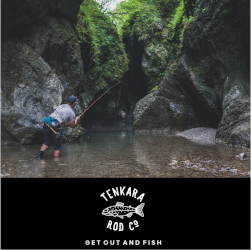 A willingness to try non-traditional Tenkara tackle and perseverance in the face of adverse Tenkara fishing conditions has paid off big time and boosted my confidence in my ability to catch fish in the future where I have been unable to catch them in the past. It can do the same for you as well, I am sure.